How to take a screenshot from a video? Sometimes you might need to take a screenshot from your video to include it into a cover for the disk with your movie, or use the created snapshots to illustrate the announcement of your video clip in the blog etc. Using AVS Video Editor, you can easily capture a particular frame of your video clip and save it as an image in the necessary format: BMP, WMF, EMF, JPEG, GIF, PNG or TIFF. 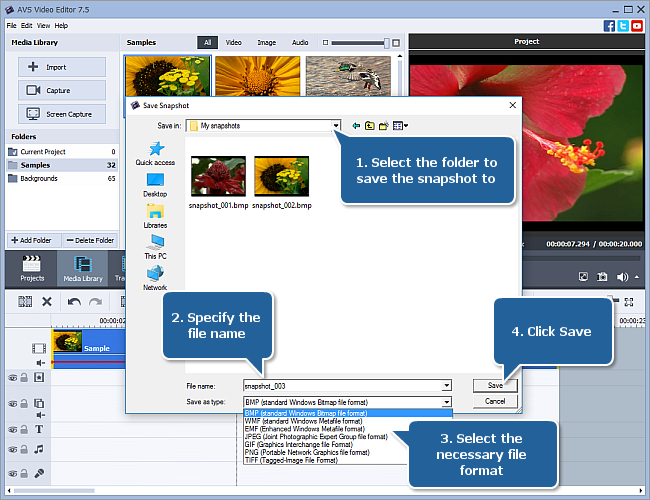 The process of taking snapshots is very quick and convenient with AVS Video Editor. After you import your video into the application and add it to the timeline, please follow the steps below to take a video snapshot in a few clicks. Drag the Zoom slider to zoom in the video on the timeline. You can also switch to the full screen mode clicking the button or using the Alt+Enter key combination. To exit the full screen mode, click the button or press the Esc key. To go to the next scene of the video, click the button. Use the button to go to the previous frame or the button to go to the next frame. Specify the folder you want to save your image file to, enter the necessary file name and select the appropriate file format for your picture: BMP, WMF, EMF, JPEG, GIF, PNG or TIFF. Finally, press the Save button. Note: depending on the aspect ratio specified for the video, the created image file has the dimensions of 640x480 or 640x360 pixels. If you need to use the resulting picture in your current project, import it into the Files and Effects Area, place to the Timeline/Storyboard and continue your film creation. To include a still frame into your movie, you can also make use of the Freeze frame option. 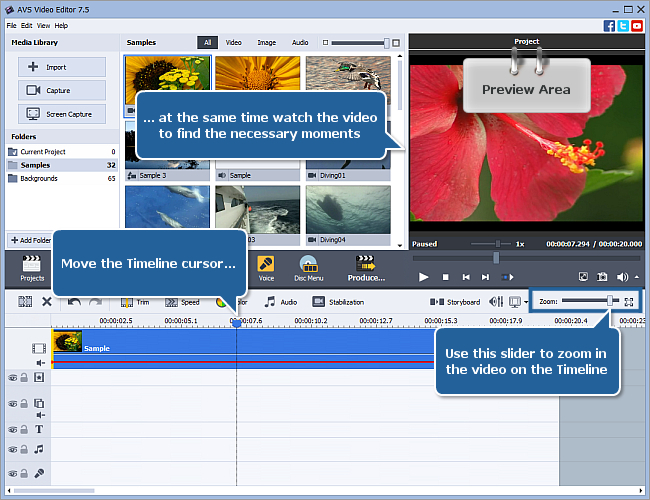 As you can see, nothing could be easier than taking a video screenshot with AVS Video Editor.